BEIJING (Reuters) - "Highly choreographed" tours to Xinjiang organized by the Chinese government are misleading and propagate false narratives about the troubled region, a U.S. official said, after China announced plans to invite European envoys to visit. China's foreign ministry said late last week it would invite Beijing-based European diplomats to visit soon. Diplomatic sources said the so-far informal invitation had gone specifically to ambassadors and was planned for this week. "Highly choreographed and chaperoned government-led tours in Xinjiang have propagated false narratives and obfuscated the realities of China's ongoing human rights abuses in the region," the official said, speaking on condition of anonymity. 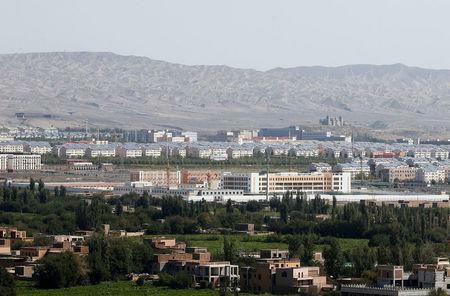 The visit this month would be the first by a large group of Western diplomats to the region since international concern about Xinjiang's security clampdown began intensifying last year. Hundreds have died in unrest in Xinjiang in recent years. The U.S. official described what was happening in Xinjiang as "a highly repressive campaign", and said claims that the facilities were "humane job-training centers" or "boarding schools" were not credible. "We will continue to call on China to end these counterproductive policies, free all those who have been arbitrarily detained, and cease efforts to coerce members of its Muslim minority groups residing abroad to return to China to face an uncertain fate." China's Foreign Ministry did not immediately respond to a request for comment. China has rejected all foreign criticism of its policies in Xinjiang, and says it invites foreigners to visit to help them better understand the region. Earlier this month, the U.S. State Department said China's treatment of Muslims in Xinjiang marked the worst human rights abuses "since the 1930s". Late last year, more than a dozen ambassadors from Western countries, including France, Britain, Germany and the EU's top envoy in Beijing, wrote to the government to seek a meeting with Xinjiang's top official, Communist Party chief Chen Quanguo, to discuss their concerns about the rights situation. Two diplomatic sources told Reuters on Saturday that government officials had said a meeting with Chen was not being offered to the European ambassadors, and that the trip was not to discuss human rights but to talk about China-Europe cooperation on President Xi Jinping's signature Belt and Road project. The European Union's embassy in Beijing has declined to comment on the invitation.